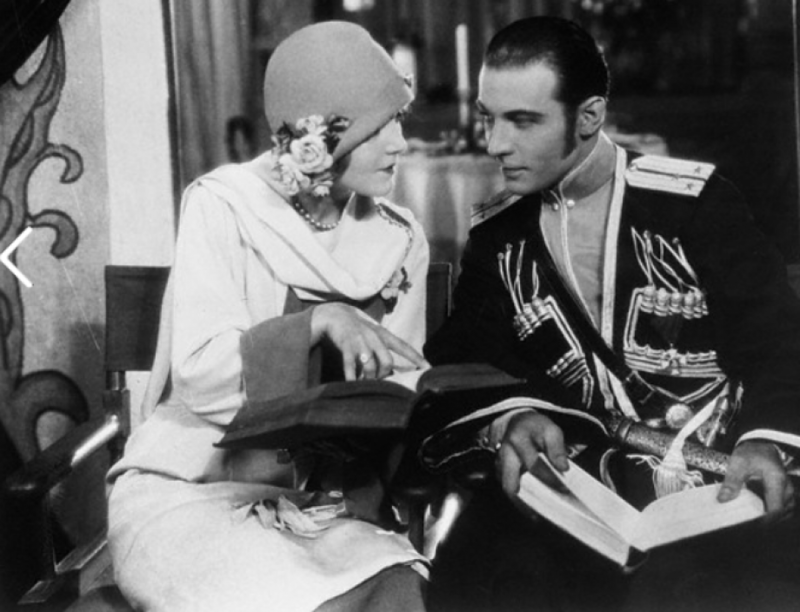 1922 – Rodolph Valentino’s Screen Smile, Which Really Masks a Sad, Sad Heart. advertisement of, the film, he said “This matter is one of great importance in the motion picture business, the mention of others on the bill weak the effect of the sole starring of the of the production and dilutes it. If company can feature two other names it can feature a dozen of them with the name of the star and the effect is lost among the other names.” And again the Great Lover complained of another time when the names of the same two young women and an actor named Walter Long and other star were printed in the advertising much his damage. Valentino complains these words “As appears by Exhibit G, I was advertised as follows: ‘With Lila Lee, Nita Naldi, Walter Long and other stars.’ “The reaction of the public mind such forms of advertising and the diminished value of the thereof to me is shot by the article from the first page of New York newspaper of September 11, 1922, hereto annexed and marked Exhibit C. etc.” Mr. Valentino further explains he can’t share his glory with anybody in these words: “The motion picture company is also enabled by such a method to use which I am sole star to divert at attention to other growing players, to whole attention is thus diverted from me an seriously effects my commercial value and by encouraging the public to look upon such growing players as a star or near star soon launches him or her as a sole star. All stars in motion pictures with any experience in the business uniformly insist upon this exclusive fixture in the contracts.” Mr. Valentino, recently married Natacha Rambova alias Winifred Shaughnessy or Winifred Hudnut, adopted daughter of the perfumery Hudnut’s before the decree had been signed divorcing from Jean Acker, his first wife. California authorities arrested Mr. Valentino on a charge of bigamy and released him. There seems to have a sort of gentlemen’s agreement. Mr. Valentino does not exactly ‘ employers for his marital troubles, he does assert that they told him I would prefer he remained “single,” as he calls it. Furthermore, he says, they far from anxious to bail him out. Finally, it was decided that it what is a good time for Mrs. Valentino to visit adopted parents in the East while bigamy clouds were hovering over It is painful to record the following even Mr. Valentino’s employers deny it. To put it bluntly, the new Mrs. Valentino was forced to travel from California to New York in a lower berth As Mr. Valentino remarks “brutality on the part of the company sending Mrs. Valentino East in a lower berth would be more apparent, perhaps to one in the motion picture business knowing the conditions and practice thereof.” It is true that Mr. Fred Kley, assistant general manager, swears to this “It was not requested to secure a compartment drawing room. I asked Valentino particularly if he wanted a lower berth an repeated to me that he did not want a compartment or drawing room but he wanted a lower berth.” Sure but His Managers Are Mean to Him and His Pictures to His Admirers? It was not Mr. Valentino’s desire to have Mrs. Valentino “constantly annoyed by newspaper representatives who would not leave her in peace, her requests to that effect, and she was several times compelled to appeal to the train conductor for protection,” as he asserts. And now comes the melodramatic Touch his detectives are prowling about, as the reader will soon see. Valentino has followed his wife to the Adirondack camp of the Hudnuts. This was after their sudden marriage and the bigamy clouds had safely rolled by. Here is the beginning of the detective melodrama as Mr. Valentino tells it “At North Creek, I was informed by the conductor on the train, who knew me personally, that a passenger had stated that he was interested in me, as he was a newspaper representative, and wanted an interview. I was interested, and at the next station left the train, saw where the man was standing, and approached close to him to see if he wished to talk to me. He saw me but made no effort to approach or converse with me. This man was a very tall man with a long, loose gray overcoat and a closely cropped moustache. I would recognize him if I saw him “I proceeded to the Waldorf-Astoria where I occupied a room. A man called at the hotel to see an employee of the hotel, and stated that he was a detective employed by the Fly Detective Agency and he made inquiry about me. This man an answered the description of the person who followed me on the train. “The only object that my motion picture employers could have for sending a detective to Foxlair Camp was to attempt to secure or claim that they had secured Some evidence at Foxlair Camp, which Would be a crime under the New York State laws, and then by threats and persuasion to secure my continued employment by the company.” Is it any wonder then, that Rodolph Valentino should end his affidavit thus “I cannot work for this motion picture corporation. I cannot endure the tyranny, the broken promises, the arrogance or the system of production. I cannot forgive the cruelty of the company to Mrs. Valentino. I cannot look forward to a sure eclipse of what promises to be a lasting career of great success, provided that I am permitted to make productions consistent with my drawing power.” Mrs. Valentino adds her affidavit to her husband’s accusations. She tells of her distress because of the lower berth incident, and of the unsympathetic treatment which she says the motion picture company official? accorded her. “When I first arrived,” Mrs. Valentino says “and at my first interview with the president of the company, he seemed to work himself into a rage and asked me how we could have been such fools as to have done such a thing and that the company would lose millions by our action; and that Mr. Valentino was ruined and that his pictures were already being stopped in various cities; that Mr. Valentino would get ten years in prison; that so far as the company was concerned he was ruined for them, and that they were through with him. “The general manager of productions frequently told me that I was foolish to remain at home and worry and that I should go out and enjoy myself. On several occasions he said in effect “You are a great fool to sit and worry about Valentino because the girls were all crazy about him and he is having a good time out there and his love for you will not list. He is an actor. My distress and agitation were extreme. I frequently wept after retiring at night and turned out the lights with reluctance because in the dark, fears and self-reproach could not be banished.” Mrs. Valentino, too, speaks of hounding by detectives. But she, like her husband, leaves the telling of the vivid details to their faithful friend, Douglas Gerrard. Mr. Gerrard is an actor and motion picture director and he makes a very good affidavitAfter relating in some detail his education and career Mr. Gerrard makes a place for himself in history by dating his friendship for Valentino from the time five years ago when Valentino repaid a loan of twenty-five dollars. This extraordinary experience the finding of an actor who promptly repaid a loan so affected Mr. Gerrard that he swore eternal friendship for Valentino, says Mr. Gerrard, B. A. (Dublin, Trinity College.) I first met Rodolph Valentino at the end of the year 1917 when he was well-known in Los Angeles. I sympathized with Mrs. Rodolph Valentino No. 2, Who Was Treated “Cruelly” by Having to Sleep in a Lower Berth, and a Lot of Other things with Valentino because he spoke very poor English, had difficulty in obtaining employment, and I suspected that at times he was actually hungry. I took no other interest in him at the time. “One day early in 19I1, Valentino asked me to loan him twenty-five dollars, which I did out of sympathy, and, perhaps, from the motive of economy, since I knew that if he did not repay me he would not ask for more. “Shortly thereafter, Valentino obtained a position and repaid me my loan from his first week’s salary, and when some time later he attempted to borrow from me a much larger sum, I made the loan willingly. This was also promptly returned. On a number of occasions, I made loans to Valentino and I have found him to be scrupulous about making repayment as soon as he obtained employment. “Mr. Valentino always lived quietly and economically and was most earnest about his work. Later Mr. Valentino and I became close friends and although he was unknown, I took an interest in him and introduced him to friends of mine. At seven or eight big parties given by me at the Los Angeles Athletic Club, where men and women were present, he made a distinctly favorable impression by his courtesy and consideration to certain of the older ladies, mothers of young ladies present, while other young men of the party were dancing with and paying attention only to the younger feminine guests. This was not from any motive whatsoever except innate courtesy and kindness.” Mr. Gerrard then goes on to describe his friend’s character. In addition to being kind to old ladies. Mr. Valentino, according to Mr. Gerrard, was economical (despite the twenty-five dollar loan), mild tempered, conscientious about his work an<l not given to gossip. He corroborates Mr. Valentino’s affidavit as to the dressing room incidents, and tells how he and others put up the bail when his friend had been jailed for bigamy. But his most effective writing is his description of a midnight battle with detective* in the wilds of the Adirondack “On Sunday night, August. 27, 1922 at about eleven-thirty o’clock, Mr. and Mrs.